It’s been a bit quiet here as I’ve been away for a few days and was then without internet whilst my supply was changed. Anyway to ease myself back into writing the blog I thought I’d give my fellow traders some feedback on the numerous Trading books I’ve been reading (or re-reading) during my period of recuperation. So let’s start with the largest tome I tore into during my lay-off. Mastering The Trade by John Carter. I’m not going to tell you much about John himself for that you can read his website bio. Just to say he’s a trader of many years experience and has an in-depth knowledge of trading various markets and instruments across many timeframes. I’ve seen him present here in the UK on a couple of occasions and I can confirm he’s the real deal. I read MTT back in 2008 and recently re-read it as part of my time spent warm and horizontal due to an injury. His main markets are Indices, Commodities, US Stocks and FX which he covers in detail throughout the book. There are plenty of detailed trading strategies that he shares with the reader. I’m not going to cover them here as I feel they are all valid strategies but whether they are the right strategy for you is another matter entirely. I know several people in the FX world who like to trade his Box Play set-up and I myself use a variant of the Holp & Lohp Set-up (Chapter 15). Nevertheless traders of any level of experience will be able to take something from his chapters on strategies. He explains them well and provides plenty of useful examples. What I personally took (and perhaps this is a reflection of my own stage of journey) is the chance to get a view on another professionals mindset on the markets, trading and themselves as a trader. I believe Chapters 1 & 2 of the book should be read and re-read by every student of markets and trading. His provides some great commentary on the markets, traders and the traders journey. His example of a trade in TASR with accompanying chart shots gives a great indication of how amateurs and professionals view and trade markets. The final 4 chapters (chapters 18,19,20 & 21) cover a pre-market checklist routine, a Traders Business Plan, what to do when you’re in a slump and a final chapter on Mastering the Trade. They are fine chapters and regardless of experience provide plenty of useful points and commentary for any fellow trader. 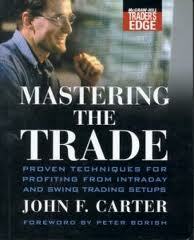 Overall Mastering The Trade is a worthy addition to any traders library, in fact it should be a certain addition. You can make your own minds up about the validity of the his strategies relevant to your own trading style. However the chapters on mindset, markets, running a business and trading in general are worth their weight in gold to any serious student of trading and the markets. I thought I would add some of the great quotes from the book to give you a flavour of where Carter is coming from. These quotes resonate with myself and hopefully you’ll also take something from them. Yep, I know they’re very similar in message……hopefully it will ram the message home! My pleasure Seok, plenty more to come!